FRA operates as a body corporate governed under the leadership of a board. FRA manages the roading assets primarily through out-sourced contracts with the private sector. The exception to this is certain maintenance work carried out by Municipal Councils and the management of roads on the Outer Islands which are administered by the Ministry of Rural and Maritime Development under a MoU with FRA. The success of Fiji’s development is dependent on infrastructure that is reliable enough to encourage people and businesses to invest in the future. Reliability means that the service being delivered by the infrastructure is consistently available without interruption. Infrastructure standards are largely driven by the need for reliability. The core element of this infrastructure is the road network. It provides the means for the movement of people and goods between businesses and local and international markets. Roads enable people to get to jobs, education and health facilities. Without reliable transport these vital connections will remain fragile and Fiji’s development will be constrained. expand the network to provide the capacity for sustained growth. The Fiji Roads Authority (FRA) was established in January 2012 to effectively manage and develop Fiji’s road network. Over the last three years we have moved from a standing start to managing a $600m-plus programme of maintenance, renewal and capital projects. The FRA uses the international best practice of Asset Management to undertake its function. This is how many other developed and developing countries look after their transport, water, electrical and other infrastructure networks. Asset Management involves using long term planning to provide the required service at the best value for money. The FRA’s ‘assets’ are all of Fiji’s roads, bridges and jetties. This includes the land on which our assets are located, together with all the associated infrastructure such as drainage, street lighting, traffic signals and other street furniture. We also consider our buildings, vehicles and other operational equipment as part of our asset portfolio. They are all managed and maintained using the same principles. On our latest estimate these assets are worth nearly $7 Billion making the road network Fiji’s most valuable built asset. The geographic extent of the FRA’s assets are illustrated in Figure 1. 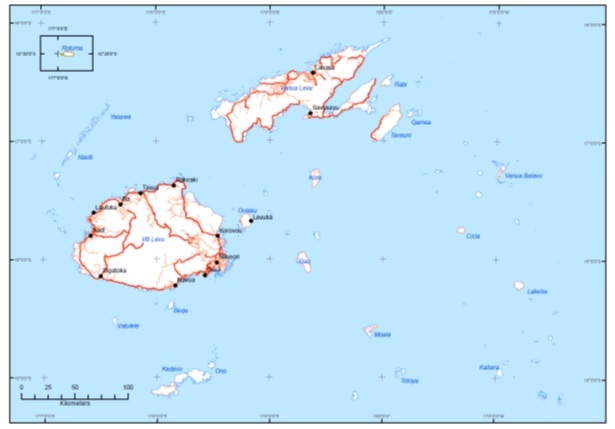 To make the network more manageable, it has been divided into three sections consistent with the administrative Divisions of Fiji. Table 1 shows the length of the sealed and unsealed roads in each Division. In 2015 FRA undertook a comprehensive survey of all of The Authority’s assets. The information collected has been incorporated in the FRA’s Asset Management System. It will be used to provide more effective forward works planning and to provide an updated valuation of the assets. The original 11,000 km length in 2012 was an over-estimate; only the DNR portion (4,200 km) was ever measured accurately, with the remaining lengths being estimates. The field data collection carried out by FRA involved a drive over of the entire network. During this exercise, it was discovered that a significant number of cane access roads did not meet the criteria of an FRA road as they only served a single property or were providing seasonal access to cane fields. These roads were not included in the FRA inventory.